With the US pivot to Asia challenging China’s regional dominance, global geopolitical rivalry has shifted to Asia. India and Vietnam involved in territorial conflicts with China would be considered as natural supporters of USA’s return to Asia. However, both these countries have adopted a balanced approach making a conscious effort to not get involved. As C. Raja Mohan and Rory Medcalf highlight in their recent paper, “these nations don’t want to put their security at the mercy of the fluctuating relationship between America and China.” Consequently, both the countries have decided to take charge of their security and have been strengthening bilateral ties, in particular, security cooperation. The recent visit of India’s Minister of External Affairs, Susham Swaraj to Hanoi from 24-26 August highlighted this trend. 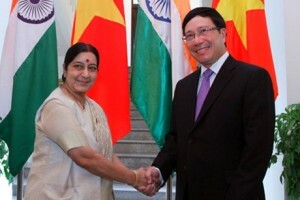 During her meeting with the Vietnamese Prime Minister Nguyen Tan Dung, Swaraj unveiled a shift in India’s foreign policy from “Look East” to “Act East”. She identified this as a crucial step to escalate New Delhi’s bilateral ties with its South East Asian neighbour(s). In this context, it is crucial to take stock of recent developments in India-Vietnam relations and in light of this evidence, see whether the change in nomenclature is just verbal jugglery or more than that. A crucial sign of commitment of the new government to push ahead its policy of “Act East” was displayed by the Foreign Minister’s recent meeting with the Indian heads of missions in South East Asian and East Asian countries. According to official sources, the meeting aimed to chart out the future roadmap and get a frank assessment about the Indian foreign policy in the region and its potential. Swaraj also inaugurated the third roundtable of the ASEAN-India Network of Think Tanks. Together, these meetings highlighted three main sectors, namely, Energy, Economy and Defence, which remain crucial for the transformation of India’s policy from “Look East” to “Act East”. Energy cooperation has played a crucial role in brining the two countries together. Indian petroleum company ONGC Videsh Ltd. (OVL) currently holds two assets in Vietnam. Block 06.1 is a producing asset and block 128 is an exploratory asset. Till March 31, 2012, OVL had invested US$ 342.78 million and US$ 49.14 million in Block 06.1 and Block 128 respectively. In comparison, China, although in violation of the United Nations Convention on the Law Of the Sea (UNCLOS), spent nearly US$1 billion on a single ultra-deepwater rig HD-981 that it placed for three months, 120 nautical miles east of Vietnam’s Ly Son Island. Block 06.1, where OVL has 45 percent of the Participatory Interest (PI), is producing over 2 billion cubic metres (BCM) of gas and 0.036 million metric tonne (MMT) of gas condensate. On the other hand, Block 128, where OVL has 100 percent Participatory Interest (PI), has proved less economically viable due to severe logistic constraints in anchoring the rig on a hard sea bottom at the proposed drilling location. In 2012, these technical difficulties almost caused New Delhi to give up exploration activities in Block 128. In order to de-risk exploration in the block, OVL has now started looking for partners and is currently in talks with PetroVietnam. In addition to these two blocks, India also received seven blocks without a competitive bid from Vietnam during Secretary General Nguyen Phu Trong’s visit to India, last November. Meeting PM Dung, Foreign Minister Sushma Swaraj, stated that India is already engaged and committed to expand cooperation with Vietnam in the oil sector. She also discussed the feasibility of exploring five of the seven oil blocks offered by Vietnam in November 2013. Crucially, just a few days before Swaraj embarked on her trip to Hanoi, Vietnam extended India’s lease over oil Block 128, by a year. The significance of this development lies in the fact that although Block 128 falls in Vietnam’s Exclusive Economic Zone (EEZ), it is also claimed by China. Vietnam’s extension of the lease is believed to have riled China, which since 2012 has displayed an open opposition to India’s involvement in the region. A particular reason for this has been the continued presence of India in the Block, despite technical difficulties in exploration. The extension of India’s license for Block 128 and its expression of a desire to explore oil in the five new blocks is a definite representation of a more proactive policy in the region. Many in India also view this as New Delhi’s determination to preserve its strategic interests in the region. Economically, there has been a growing synergy between India and Vietnam. India has extended seventeen Lines of Credit (LOCs) to Vietnam totalling US$ 164.5 million. In terms of investments, India was ranked 30th out of 101 nations and territories investing in Vietnam, with 73 projects worth over US$ 253 million. India’s investments in Hanoi encompass diverse sectors, including oil and gas exploration, mineral exploration and processing, sugar manufacturing, agro-chemicals, IT, and agricultural processing. Some of the major Indian investors in Vietnam are: OVL, Essar Exploration and Production Ltd, Nagarjuna Ltd, Venkateswara Hatcheries, Philips Carbon, and McLeod Russell. Tata Power joined this list last November, when during the visit of Secretary General Nguyen Phu Trong to India, it signed an agreement with the Vietnamese government for setting up the Long Phu II Thermal Power Plant. Costing US$ 1.8 billion, this project has become the biggest investment by an Indian company in Vietnam. Markedly, this investment has brought India at par with China in terms of investment in Vietnam’s thermal power plant sector. Today, one of the most prominent Chinese presence in Vietnam’s thermal power plant division exists in the form of the US$ 2 billion Vinh Tan I Power Plant. China’s Southern Power Grid Company Limited (CSG) and China’s Power International Holding (CPIH) account for 95 per cent of the total investment capital, while the remaining 5 per cent is being contributed by Vietnam’s state mining conglomerate Vinacomin. Bilateral trade between India and Vietnam has also been gathering momentum. However, it constitutes a small percentage of India’s total trade. By 2013-14, India-Vietnam bilateral trade was US$ 8 billion, well on its way to reach the US$ 15 billion target by 2020. However, it constituted only 1.05 percent of India’s total trade. In comparison, China is Vietnam’s largest trade partner, with Sino-Vietnam trade currently pegged at US$ 50.21 billion. Understandably, during Sushma Swaraj’s visit, economic cooperation was recognised as the second sector, which has an immense potential to boost Indo-Vietnam bilateral ties. The Foreign Minister called on the two countries to double and triple trade, conclude negotiations on a bilateral free trade agreement, and launch a direct air route in the near future. The Foreign Minister also conveyed the desire of Indian firms investing in large infrastructure projects of Vietnam and signing deals with Vietnam in the field of corn and rice production, and catfish breeding. Defence cooperation was recognised not only as being extremely crucial for both the countries but also mutually beneficial. Thanhnien, a leading daily of Vietnam reported that India’s Foreign Minister during her meeting with Prime Minister Dung praised the security-defence role of Vietnam and expressed India’s desire to partner with Vietnam in this arena. India added to the Vietnamese Foreign Minister’s statement that although it is a non-participant in the South China Sea dispute, it has an interest in ensuring that there is free right of navigation and access to natural resources in that region. Besides, getting an understanding of India’s stand in the region and reiterating its conformity with Vietnam over the South China Sea issue, the visit also involved military agreements between the two countries. India, like Vietnam has been using Russian military platforms for decades and has therefore emerged as its key defence hardware partner in matters of training and spares. Alexander Korablinov writing for the Russia & India Report stated that during Sushma Swaraj’s visit to Vietnam, the two countries finalised details of a defence agreement under which India will train Vietnamese pilots to operate Russian-built Sukhoi fighters. Already, in accordance to last year’s agreement, India has agreed to train up to 500 Vietnamese sailors in “comprehensive underwater combat operations” at its modern submarine training centre, INS Satavahana. India and Vietnam have also been involved in frequent port visits. Just a few days before Swaraj’s visit, the Indian naval ship INS Shivalik carrying more than 500 officers and crew anchored at the Chua Ve port in Haiphong. Notably, this was the sixth Indian Naval ship to have anchored at the Chua Ve port since 2008. In the three-day stopover, the crew-members paid a courtesy visit to the leaders of Haiphong and provided technical support for Vietnamese naval soldiers. There are also speculations that Hanoi had permitted Indian naval ships to berth at the Nha Trang Port, which is just south of China’s new naval base at Sanya in Hainan Island. However, there is no official evidence of India accepting the berthing rights. Another speculation doing the rounds is regarding India’s decision to sell the Indo-Russian Brahmos missile to Vietnam. However, as officials put it “a deal is not imminent”. While the sale of the Brahmos to Vietnam remains uncertain, what is sure is that Vietnam is the first South East Asian country to have received USD 100 million, as Line of Credit (LOC) from India, for the purchase of four offshore Patrol Vessels. Evidently therefore, one can note an increasing cooperation between Hanoi and New Delhi in all sectors. At the same time however, it is crucial to highlight, that Beijing remains the largest and the second largest economic partner for Vietnam and India respectively. It is not surprising therefore, that the two countries continue to justify their cooperation in the disputed South China Sea, on grounds of international laws rather than personal biases. This was once again reflected during the recent visit, where leaders of both the countries agreed to uphold international laws and thereby support a peaceful resolution of the South China Sea dispute. While it is too early to judge the success of the new government’s “Act East” policy, one can note a definite move by New Delhi towards proactive engagement. As Hanoi, gets ready to welcome India’s President Pranab Mukherjee, between the 14-19 of September, Foreign Minister Sushma Swaraj statement that Vietnam enjoys a prioritised position in India’s Look East policy begins to ring true.